Fat. We need it. Healthy fat promotes healthy skin, it helps the body absorb vital nutrients, it is a great source of energy, it plays an important role in brain development in children, and of course, it makes everything taste better! Coconut Oil – I’m sure you all guessed that would be my number one oil of choice. Yes, coconut oil has had a bad rap for many years, but it is full of amazingly healthful properties and your body loves using it as an energy source. It is a Medium Chain Fatty acid which your body can process and utilize very quickly for energy. It also raises good cholesterol, and balances out blood sugar without the weight gain, cholesterol, and other health risks that come from other saturated fats. Make sure to purchase organic, unrefined, raw oil to receive the maximum benefits. It is a very stable oil so it is great to use when higher heat is necessary. 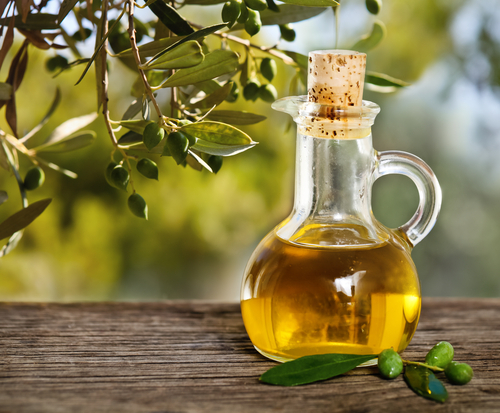 Olive Oil – We all know how good it is for you! It is full of mega nutrition, heart healthy fat. It is one of the oldest and most valued oils in history. However, olive oil has a low smoking point, which you can see when it is heated too high. It is best to cook with it on a low heat to prevent oxidation and maintain nutrients. If your oil begins to smoke, it is best to remove the oil and start over. Flax seed oil – is rich in Omega 3’s. It is great for salads, smoothies, and other cold foods. It is not for cooking at all. Heat will oxidize this oil. Seseme oil – is high in the antioxidant Vitamin E, which is great for skin and nails. It is very stable cooking at high heat. It has a great nutty flavor and is perfect for stir fry’s. Ghee (clarified butter)- a natural fat that does not need to be refrigerated because it contains no milk solids. It has a higher smoking point than butter and can replace butter in recipes and with cooking. It is entirely fat, so it is best to use with moderation. Tallow (beef fat)- Yes, that too is considered a healthy fat. It is natural. Remember, obesity was never a problem with our ancestors until processed foods came into the picture. Did you know that McDonald’s French Fries used to be fried in beef tallow up until 1990 when they switch to a partially hydrogenated vegetable oil? So they actually used to actually be somewhat healthy! Butter – all natural and a real food fat. Great for cooking over medium heat. Avocado oil – Very nutritious and great for cooking and has an unusually high smoke point. Make sure it is unrefined and cold pressed. There are a lot of great options for cooking. It is so easy to avoid processed vegetables oils when you are cooking your own meals at home, but it is near impossible to avoid them completely. They are loaded in processed foods, and many restaurants use them. Make sure to read ingredients of the foods you buy, and eat at home as much as possible. Remember health starts in YOUR kitchen. Move over “lite,” “fat-free,” “low-fat,” and say yes to REAL FOOD and REAL FAT. Me too! I keep a jar in my bathroom! It is the best makeup remover as well! Thanks! This is super helpful. I wish is liked the taste of coconut and coconut oil. It is so good for us, but I just don’t like the taste. I’ve never heard of using avocado oil. I think I will try that when cooking with higher temperatures!